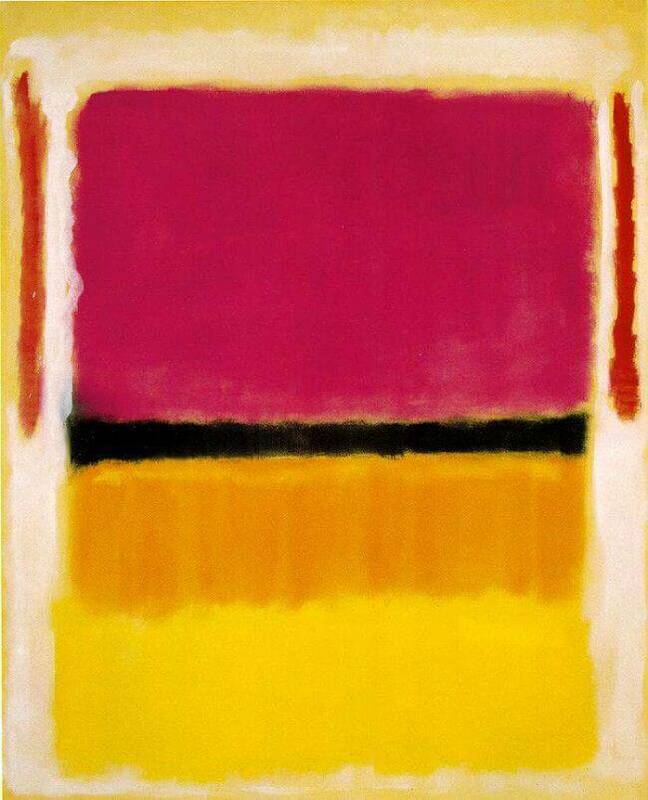 With paintings such as Untitled (Violet, Black, Orange, Yellow on White and Red), Mark Rothko arrived at his mature idiom. For the next 20 years he would explore the expressive potential of stacked rectangular fields of luminous colors. Like other New York School artists, Rothko used abstract means to express universal human emotions, earnestly striving to create an art of awe-inspiring intensity for a secular world. In order to explain the power of his canvases, some art historians have cited their compositional similarity to Romantic landscape painting and Christian altar decoration. Anna Chave suggests that Rothko's early interest in religious iconography underlies his later work. She sees a reference to a Madonna and Child in Untitled (#17), an apparently abstract work that developed out of the Surrealistic biological fantasies that he had been painting in the early 1940s. For Chave, mature paintings such as Untitled (Violet, Black, Orange, Yellow on White and Red) metaphorically encompass the cycle of life from cradle to grave, in part by harboring an oblique reference to both adorations and entombments. The stacked rectangles may be read vertically as an abstracted Virgin bisected by horizontal divisions that indicate the supine Christ. 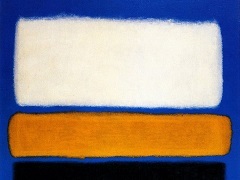 Even without Chave's argument, it is clear that Rothko hoped to harness the grandeur of religious painting. The principles of frontality and iconic imagery in his mature works are common to traditional altarpieces, and both formats have similar dimensions and proportions. Often larger than a human being, Rothko's canvases inspire the kind of wonder and reverence traditionally associated with monumental religious or landscape painting.